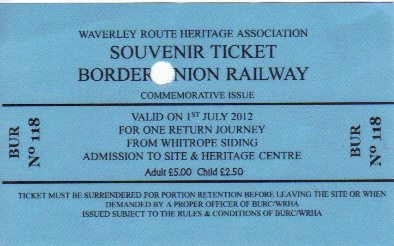 I enjoyed myself at the opening of the Border Union Railway Line http://wrha.org.uk (part of the former Waverley Route) at Whitrope Station (in Castleton parish) on Sunday 1st July; accompanied by two friends, one of whom is a son of a former engine-driver on the route. 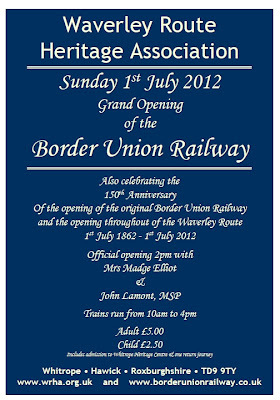 It was an auspicious date, chosen to celebrate the 150th anniversary of the Hawick to Carlisle railway line. 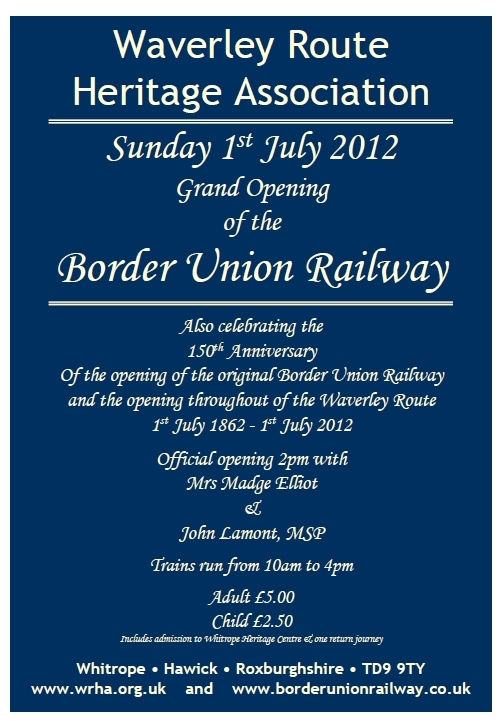 The opening was performed by John Lamont, MSP and Madge Elliot . Although they have about a half-mile of track, the bridge positioned after the first 300 yards hasn't had its certification yet, so the train (a railbus) made two return journeys of 300 yards back and forth for each set of passengers. I chatted with Ian Crooks, the chairman, during the short journey. They've made amazing progess since the last time I visited in August, 2009. Not only have they laid a lot more track, painted carriages, made a nice station, they've also found time to improve the exhibition. There's more dates to visit the Waverley Route Heritage Centre at weekends until the end of October, and ride on the train in July and August. Timetable. It was nice to see several of my ex-colleagues from Scottish Borders Council, two of whom are volunteers, as well as several fellow members of Borders Family History Society.